Theresa May reminds me of a wounded antelope that is just after surviving yet another savage attack from hyenas and lions. The poor antelope is haemorrhaging blood, she is tired from running from the chasing pack, and just wants to find some clean, nutritious water in the shape of an acceptable deal for all parties involved. Nobody can doubt the antelope’s tenacity and bravery in surviving this long, but the vultures are circling now. Waiting to feast on the exhausted animal. The race to replace is on. There are several contenders hoping to take on the Conservative leadership, none of which fill me with great hope. Dominic Raab has successfully catapulted himself to the front of the queue with shrewd, measured and subtle tactics. When May established her first cabinet to deal with Brexit, the ambitious MP for GHDJS was furious to miss out on a post, so when the opportunity presented itself to be the Brexit Minister, he probably felt it was long overdue. And to his credit, he has walked the political tightrope very well. Many Eurosceptics now see him as their “Golden Boy” whilst the moderates of the party see him as the least worst of the Brexiteers, so to speak. But, the Rt Hon. gentleman is an entirely self-serving individual, and that makes him very dangerous. I imagine he sees himself as the heir to David Cameron and I don’t doubt he thinks he would be the greatest Prime Minister the United Kingdom has ever seen. However, his lack of experience in senior government is extremely alarming. A couple of months in a big job and he jumped ship. 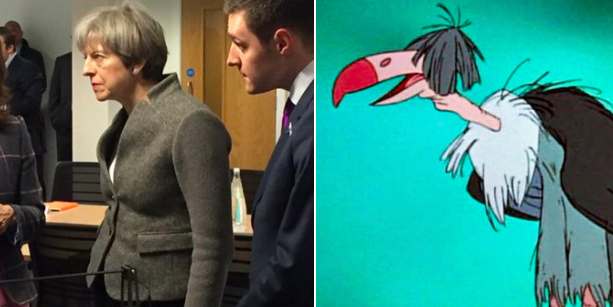 At least we know with May that she has Public Office and Public Service coursing through her veins. A man who has been under public scrutiny for years and needs no introduction when we come to discuss the Tory leadership, is, of course, Boris Johnson. If I have described Raab as a self-serving individual, then I honestly don’t know what adjective to describe BoJo with. His leadership bid has lasted longer than a Leonard Cohen song and shows no signs of waning anytime soon. But even he is keeping his head down for now. Instead, Jacob Rees-Mogg has broken cover. Setting the pace for a leadership bid that he knows will fall short. But Boris is on his wheel. Tucked in and slipstreaming off Rees-Mogg’s support for all it’s worth. At the right time, I imagine Rees-Mogg will give way for Johnson, and in turn will be rewarded with a lucrative cabinet position should Johnson prove successful. Then we have Michael Gove: a man who has crept back into the shadows following his escapades in the previous leadership election. It is conceivable that should he fail, his supporters will back Johnson and vice versa. Even with the backstabbing Gove carried out, himself and Johnson are the true Blood Brothers of Brexit, and their supporters will remember that when the day of reckoning comes. But for now, Gove remains quiet and concealed. He was offered the job of Brexit Secretary following Raab’s resignation, but it was no great surprise when he turned it down. Attempting to be a strong Brexiteer and work with May on getting the best possible deal from within cabinet is no mean feat, but if anyone can do it, Gove can. He still commands a great deal of respect within the Tory Party, and even if he doesn’t win the leadership, whoever he endorses will be all the better for it. The remainder of potential candidates are made up of two Tories who seems to have been about forever, and a woman on the rise in the party. Jeremy Hunt has always been a divisive figure, but he is very good at weathering a storm. He has managed to walk away relatively unscathed from many NHS crises and remains a very prominent member of the cabinet. He has always held leadership ambitions but isn’t likely to gain a great deal of support from within his own party. The Tory top brass will recognise that the public still can’t stand the man, and thus, he will not ne a serious leadership contender. Sajid Javid could be. The MP for Bromsgrove and current home secretary is another with great ambition to be leader. He always had his reservations about the EU but backed remain as he thought that side would win, and he’d be in a better position because of it. After the loss, he has slowly changed his tune, much like Jeremy Hunt and wants a Brexiteer’s Brexit. It is thought that he voiced huge opposition to May’s current New Deal but has decided that it’s better to be inside the tent. He is a potential leader, but not one at the top of anyone’s lists. Finally, we have Penny Mourdant. She could prove very popular with a Conservative party looking for change and the public who would recognise her as not part of any Eton boy clique. She’s held in high esteem by her party and Labour party somewhat fear her. She has a wealth of experience despite her relatively young age and has the backing of several Brexiteers. Currently, she is doing the hokey-cokey within cabinet in an attempt to gain a free vote on May’s deal. It won’t convince the PM, but it could be a manoeuvre to impress the rest of the party that could very well work. In any case, Mourdant, like many mentioned above will surely secure a senior cabinet position should she not make an attempt on the leadership. So that’s our contenders…for now. In the coming weeks ahead, we will see if the 48 letters are met and if any other ambitious Tories want to throw their hat in the ring for leadership. Or maybe, the antelope will find a water source, recover and run free again.